Dan Walsh is known for his large-scale geometric work. 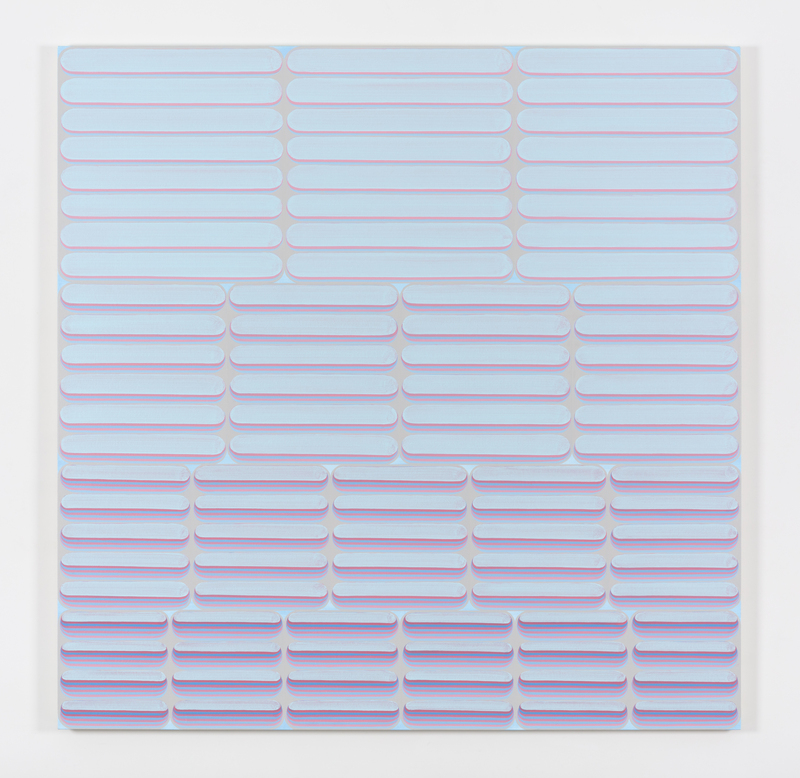 I was introduced to his paintings at the 2014 Whitney Biennial. At his solo exhibition at the Paula Cooper gallery I was immediately drawn to his large scale square paintings. Not only do they feature geometry, they also present the theme of counting. 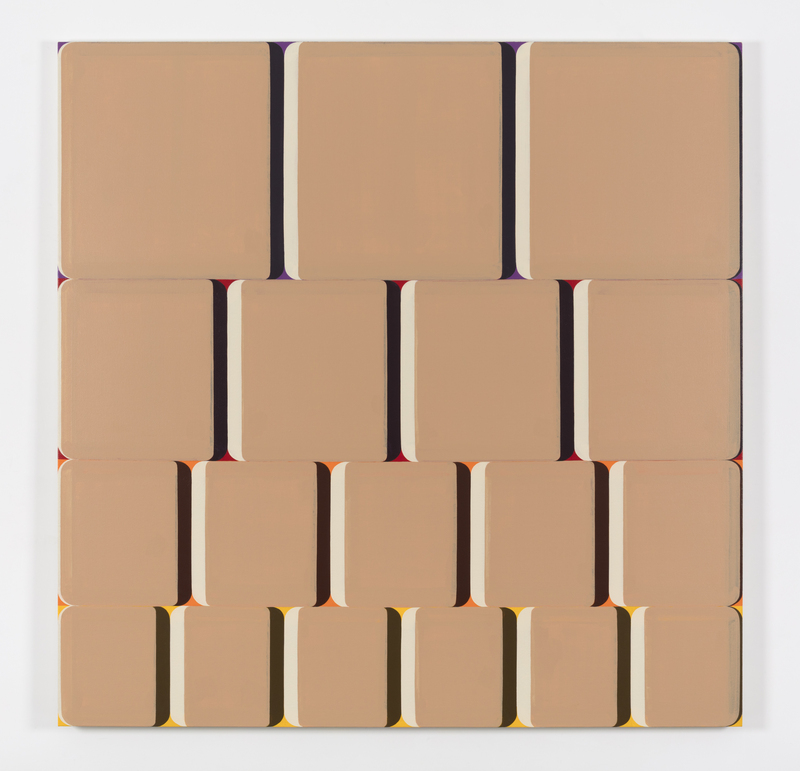 In the painting “Fin” from 2016 the canvas is divided in to four horizontal rows of varying widths. Thickest on the top with 3 sections divided by black and white parenthesis and narrowest on the bottom divided into six segments. Since the width of each row is the same the progression 3, 4, 5, 6 segments presents a visual comparison of the fractions 1/3, 1/4, 1/5, 1/6. 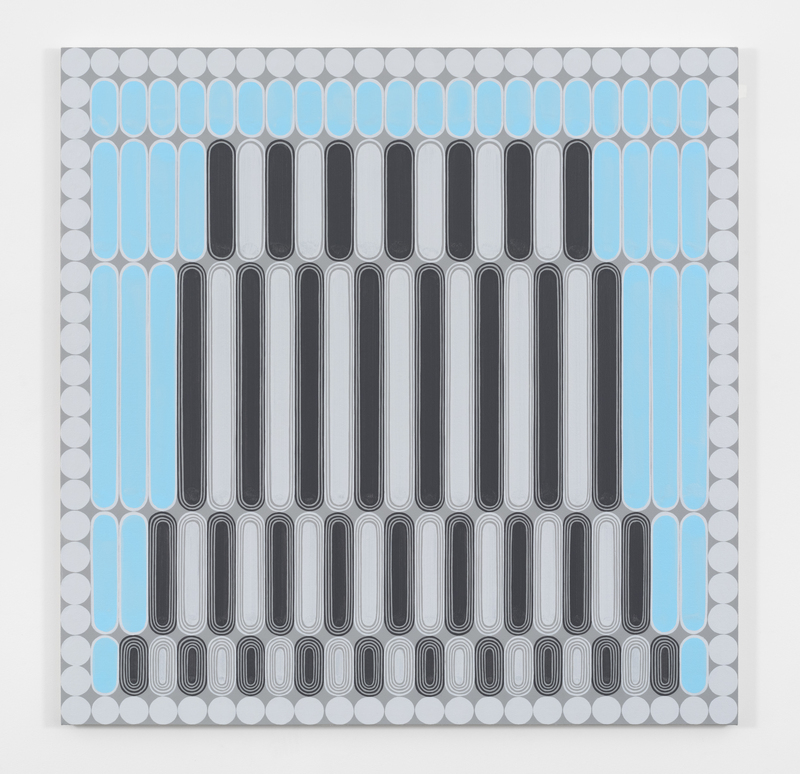 “Debut” from 2016 the artist uses the same 3, 4, 5, 6 divisions in horizontal rows but this time groupings of thin lozenge shapes make up the pattern. There is a stack of 8 lozenges in the rows of three, 6 lozenges in the rows of four, 5 in the rows of five across, and 4 in the rows of six. Instead of having all of the shapes the same base color like in “Fin”, Walsh has created a scale with the more intense blues in the bottom row, grounding the picture space, almost like a landscape. The painting “Circus”, also from 2106, presents a more architectural form. Working once again with rows of varying width this has seems to have more of a subject and background. The alternating black and white coloring of the vertical thin lozenge-like strips create a tower. The rows grow from 13 to 15 to 17 to 19. Each row gaining one strip on both the left and the right sides. Dan Walsh’s painting style is both precise and systematic, but his choice of numerical subject matter that everyone can relate to creates a joyful imagery.